Antonio Tobias "Toby" Mendez is a Maryland based sculptor with over 25 years of experience creating significant works of art. Born in Colorado in 1963, Toby spent most of his childhood in Japan and Thailand. In 1974, his family moved to Maryland where for four years, Toby attended sculpture classes and honed his fine art skills in a gifted and talented summer program for young artists held at Goucher College. Through this intensive creative experience, at the age of 16, Toby chose sculpture as his career path. Toby apprenticed under the Academy Award winning makeup sculptor John Chambers and then entered the Art Institute of Chicago receiving his BFA. While at the Art Institute, Toby learned the processes of bronze casting practiced by sculptors and fine art foundries for centuries. This hands-on technical experience afforded Toby the early opportunity to cast his own works in bronze and to accept his first commissions. Also while at the Art Institute, he travelled and lived abroad for a year in Spain where he studied the techniques used in creating large scale monuments. 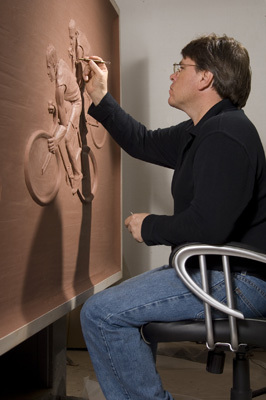 In 1988, Toby set up his studio in the Maryland/DC area where he actively sculpts both private and public commissions. Toby primarily focuses on the figure, combining a classical figurative approach with a contemporary eye for site design. In addition to creating lasting legacies through public art, Toby continues to create personal works for acquisition by private collectors. Toby’s untiring work as a sculptor for over 25 years, allows for the unique sensibility and insight in his work. This is well noted in the larger public works such as his Thurgood Marshall Memorial, and The Teammates for the Boston Red Sox. Please Contact the studio for more information or go to our Media Page to download a Press Kit.